“Black lives matter, black lives matter, black lives matter.” Black Lives Matter there’s no one way to define it. Black Lives Matter (BLM) is an international activist movement, originating in the African- American community, that campaigns against violence and systemic racism towards the black community. BLM holds protest speaking out against police killings of black people, and broader issues such as racial profiling, police brutality, and racial inequality in the United States criminal justice system. In 2013, the movement began with the use of the hashtag #BlackLivesMatter on social media after the acquittal of George Zimmerman in the shooting death of African-American teen Trayvon Martin the preceding February. Black Lives Matter became nationally recognized for its street demonstrations following the 2014 deaths of two African Americans: Michael Brown, resulting in protests and unrest in Ferguson, and Eric Garner in New York City. 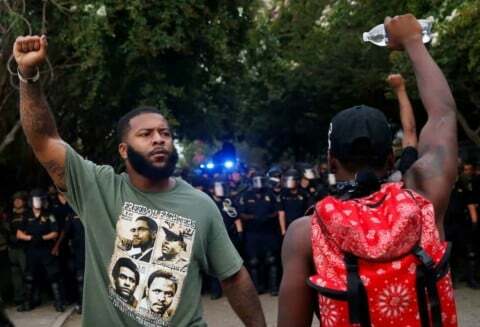 Since the Ferguson protests, participants in the movement have demonstrated against the deaths of numerous other African Americans by police actions or while in police custody. In the summer of 2015, Black Lives Matter activists became involved in the 2016 United States presidential election. The originators of the hashtag and call to action, Alicia Garza, Patrisse Cullors, and Opal Tometi, expanded their project into a national network of over 30 local chapters between 2014 and 2016.The overall Black Lives Matter movement, however, is a decentralized network and has no formal hierarchy. The US Census estimates of 2015 (the most recent available), Blacks made up 13% of the population. However, in 2015 they accounted for 26% of those that were killed by police, in 2016, 24%, and in 2017, 22% of all those killed by police. In other words, Blacks were the victims of the lethal use of force by police at nearly twice their rate in the general population. Whites make up the plurality of victims of police use of lethal force (45% in 2017), BUT they also make the majority of the population (62% in 2015). After looking into every facts about police brutality against the black communities, we need to do more, stand and speak out on our Justice to be here, to live on the country we we’re born into. This is what I believe in and there are many things we can do to let people hear what we are standing for. Making our movement being more known, starting with being more about it, getting more to join and this can start with just one voice, one voice to stand and speak out on what we can change. Black Lives Matter by Naja is licensed under a Creative Commons Attribution-ShareAlike 4.0 International License. black lives matterWhose really listening?